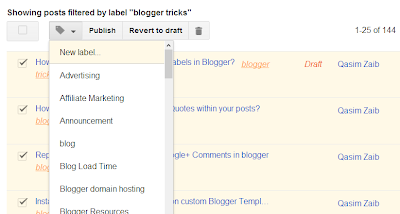 How To Create, Delete, and Change Labels in Blogger? When writing a blog post in the Blogger Editor, you have a Label section on the right sidebar where you can assign that post some labels. However, that is only useful for a single post. What if I wanted to assign a label to multiple posts? To do that, go into your Blog Dashboard, and click on Posts on the right sidebar. When you see a list of all your posts, you can select multiple posts by checking on the box on their left. Now, click on the Label action button on top of the list of posts, and choose a label to assign. Alternatively, you can create a new label. The label you create or select will be assigned to the selected posts. If that label was already assigned to a selected post, then it will be unassigned. Unfortunately, you can not edit a label in Blogger the way you can edit tags and categories in WordPress. But that doesn't mean you can't get the job done. If you want to rename a certain label, then simply select all posts from that label, and change their label. To do this, first get a list of all posts under a certain label by clicking on the Label selection button on the top-right. So suppose I wanted to list all posts with the label "blogger tricks". I will simply select that particular label from the selection button. Now, to change a label, select all posts under that label, and assign them a new label of your choice as we discussed earlier. Once this new label has been assigned, select all the posts again, and unassign the previous label by clicking on the Label action button, and clicking on the label you want to remove from those posts. As described earlier, posts that already have that label will get unassigned to that label. Not the slickest implementation to be honest, but it does the job. Blogger manages the creation of new labels, and deletion of unused labels by itself. So if no posts are assigned to a label, it will be automatically removed. Assigning posts to a wrong label could mess things up pretty bad, and if you have a lot of posts selected, you will have to manually pick and select each of them, and then reassign them, which could be a real nasty job. So double-check before assigning a label to a large selection of posts. Also, Blogger doesn't really handle a selection of more than 50 posts well, and will mostly generate errors if you try to change labels for more than 50 posts. So make sure each selection of yours isn't above that limit. Thanks MBT 4sharing this tip. I need your help very urgently. Please open my blog once www.tallyssolution.blogspot.com. Before a week my blog is not show wishlink ad on my blog. But now it is appear automatically. Please suggest how can i remove this ad. Because i am too much tired to see this ad. It is automatically appear on my blog, i do not enter any code of this script. Please help me. Hi, I'm familiar with using label on posts. What I would like is help with offering contributors to my blog the opportunity to add labels to comments as this would allow other users to search comments based on comment labels in addition to post labels. good information for new bloggers thank you,.. 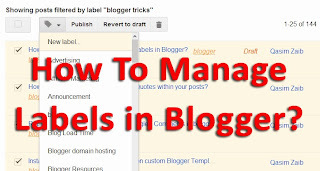 Thanks very much for that help regarding Blogger labels. It is appreciated as is your time for sharing that knowledge. Great, but do I have to redirect a tag after I remove them? or does Blogger handle that?